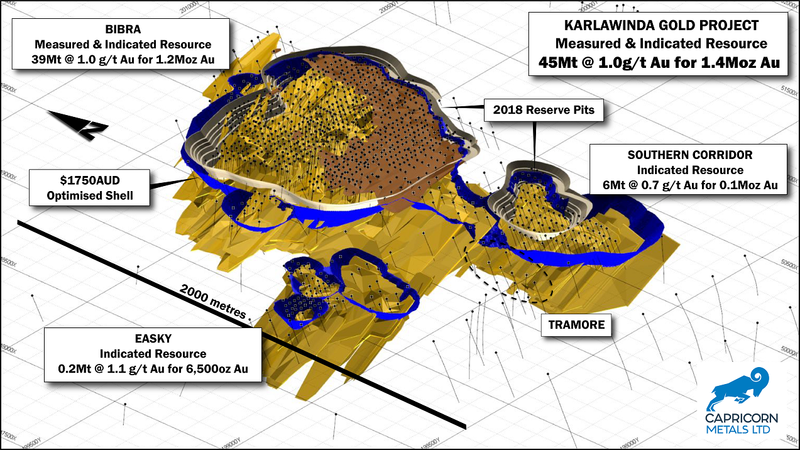 The Karlawinda Gold Project is located in the Pilbara region of Western Australia, 70km by road south-east of the town of Newman (Figure 1). 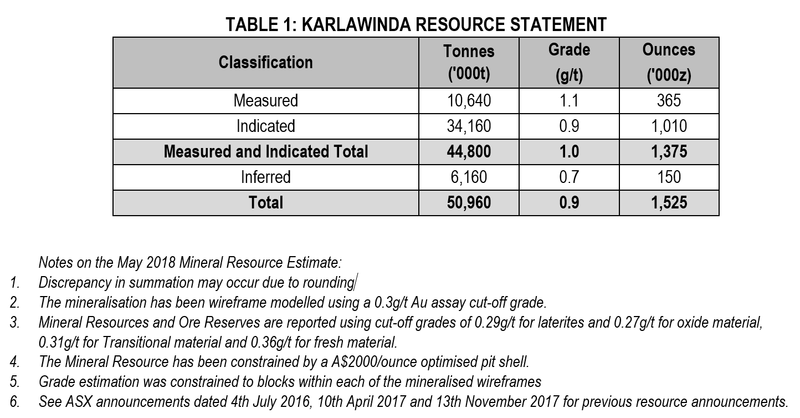 Karlawinda is an advanced gold project which includes the Bibra deposit and numerous outstanding exploration targets including the Francopan prospect. The project area is close to key infrastructure and mining support services. 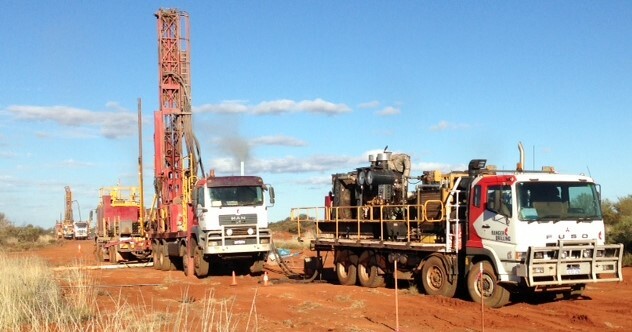 Gold mineralisation at the Francopan Prospect was originally discovered by WMC Resources Ltd in 2005. 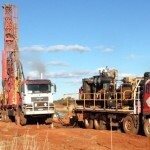 The project was subsequently acquired by Independence Group (IGO) in 2008 resulting in the discovery of the significant Bibra Gold Deposit in 2009. Capricorn acquired the project in February 2016. At the time of acquisition of Karlawinda from IGO by Capricorn, approximately A$12 million had been spent on regional exploration, resource evaluation and prefeasibility activities. Since acquisition Capricorn Metals have advanced the project by, drilling 120,000 metres, increasing the resource by over 100% from 650Koz to 1.5Moz, estimating the maiden reserve, completing a definitive feasibility study, further increasing the reserve by 25% in May 2018, granting of mining lease and approval of all major permits and signing of major agreements. 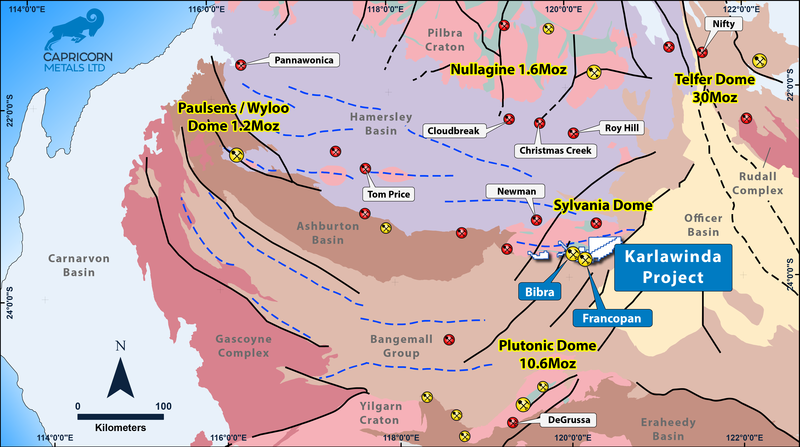 The Karlawinda Gold Project is located in the Sylvania Inlier, on the southern margin of the Pilbara Craton. The Sylvania Inlier is a small elongated Archean (>~2.75 Ga) granite-greenstone province which consists of low- to medium-grade metavolcanics, mafic and ultramafic intrusions, and metasedimentary rocks, which have been intruded extensively by granitoid rocks. The gold project lies within the Karlawinda Greenstone Belt which spans the southern margin of the Sylvania Inlier and is part of a large-scale Archaean aged gold mineralized system. 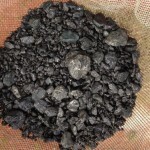 45MT @ 1.0g/t for 1.4Moz. 50Mt @ 0.93g/t for 1.5 Moz. The Bibra Deposit has a strike length of over 2.5km and a down dip length of 2.5km and is open along strike and down dip. The geology at Bibra comprises a sequence of alternating Archaean amphibolites and garnet schists with the majority of mineralisation hosted in silicified and magnetite altered, mylonitised sandstone (Figure 3). 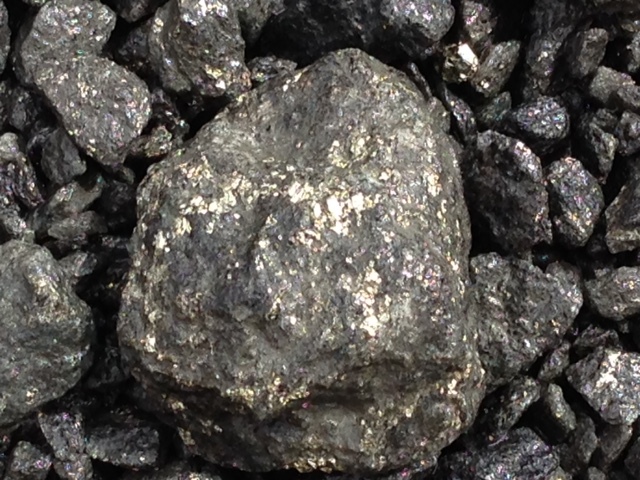 Gold mineralisation is present in two parts including laterite and oxide/primary mineralisation. The laterite mineralisation lies just below the surface and consists of pisolitic lateritic duricrust composed of maghemite, goethite and hematite. 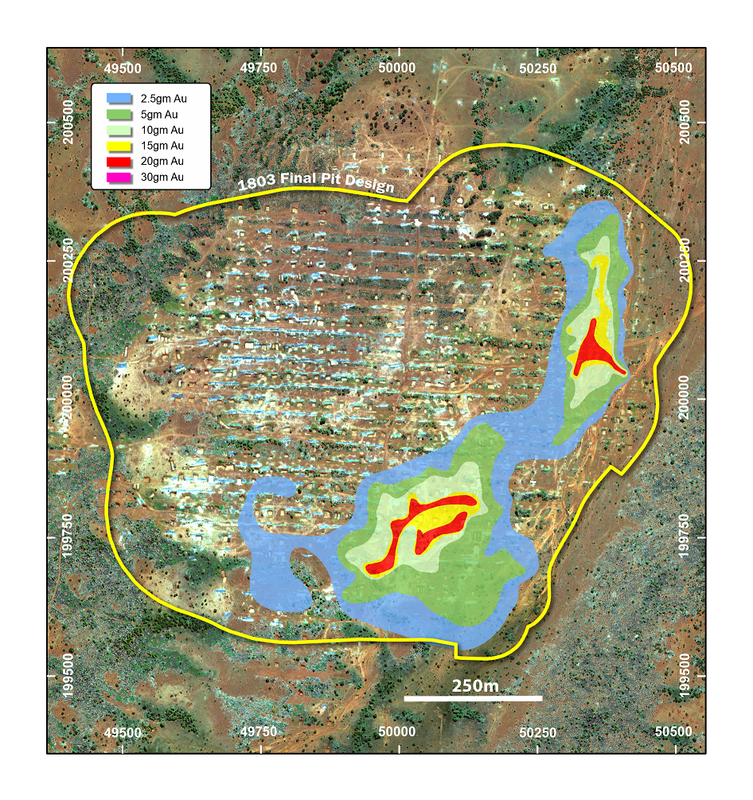 The laterite gold mineralisation is 900 metres long by 700 metres wide with a higher-grade zone where the oxide/ primary mineralisation come to surface (figure 4). Oxide gold mineralisation occurs below the laterite gold mineralisation, approximately 10 metres below surface, and is hosted in kaolin and smectite rich clays and is approximately 60m deep. 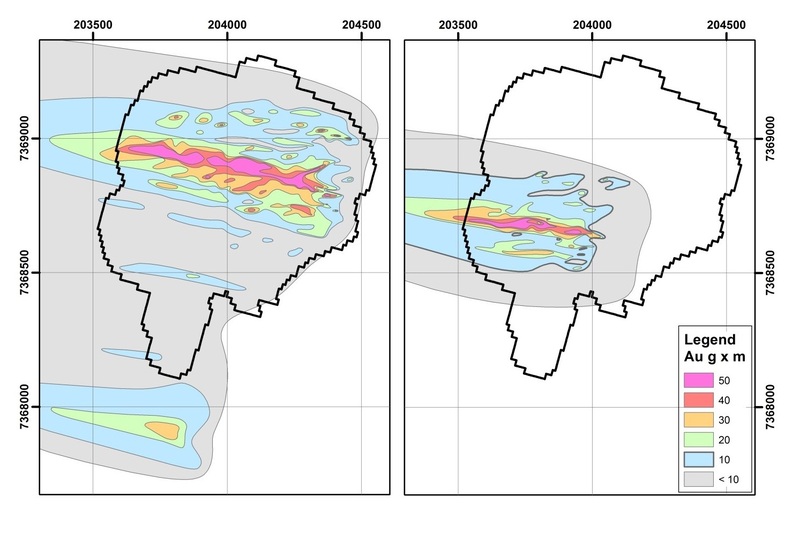 The oxide/primary mineralisation gold mineralisation has developed on at least two parallel, 40m thick, shallow dipping sandstone units, which dip to the west-north-west at 22° (figure 5). The primary mineralisation has developed in two main lodes named the Main footwall and Main Hangingwall. These lodes strike NE-SW and dip west-north-west at 22°. The gold mineralisation is strata-form with lineations identified as controlling higher-grade shoots. The lodes are typically wide intercepts (e.g. 40m @ 0.9 g/t Au) but high-grade shoots have developed parallel to the metamorphic fabric plunging to the west-north-west in a rod-like geometry (figure 6) . Down-plunge the grades and thicknesses remain consistent whilst along strike they are more variable. 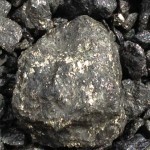 The primary mineralisation in fresh rock is marked by 3-10% sulphides, subhedral magnetite grains, quartz veins/veinlets, and fine-grained gold. Outside of the main mineralization, more discrete lodes occur. 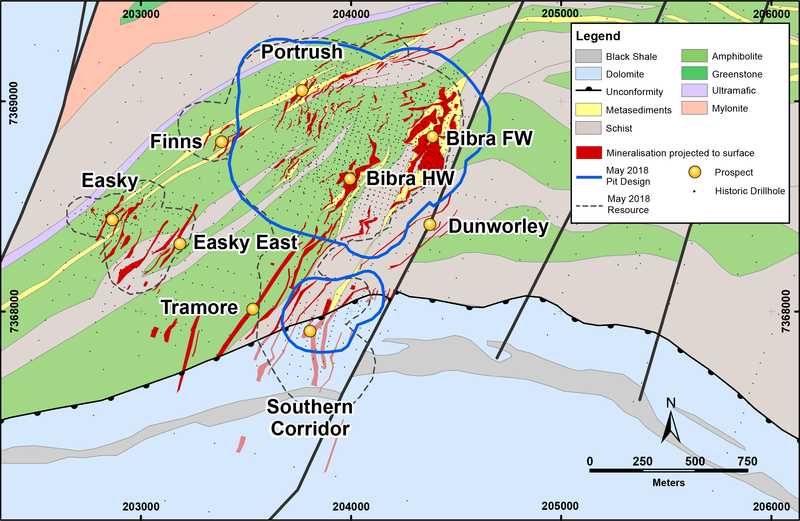 In the hanging wall to the main mineralisation, Port Rush, Easky, Finns and Easky East ore domains occur and to the south of Bibra, Mineralisation continues south from the main pit area into the Southern Corridor and Tramore lodes (Figure 7). 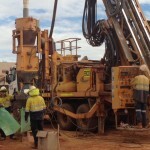 The scale of the Bibra Deposit was tested at the start of 2018, with a drillhole targeting 1km down dip of the westernmost drillhole (figure 8). The results from this hole of 33m @ 1.42g/t Au from 697m, including higher grade intercepts of 5m @ 4.5g/t Au from 708m and 3m @ 4.6g/t Au from 725m demonstrates potential for the continuation of high-grade mineralised domains. 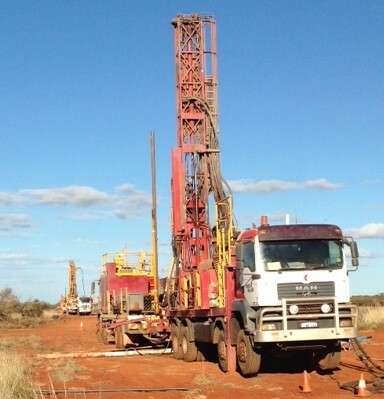 This new step-out deep drilling potentially doubles the footprint of the Bibra Exploration Target. Figure 8: Section 200050mN conceptual cross-section showing EIS hole target. This represents an increase of 200,000oz from the November 2017 Mineral Resource. 90% of the Mineral Resource is now classified in the high confidence Measured and Indicated categories and ounces per vertical metre peak at over 10,000 between 60 and 80m from surface. The Karlawinda Project is 110 km wide by 30 kilometers long, consists of thirteen granted tenements and covers 1750km2 of highly prospective geology of the Sylvania inlier. 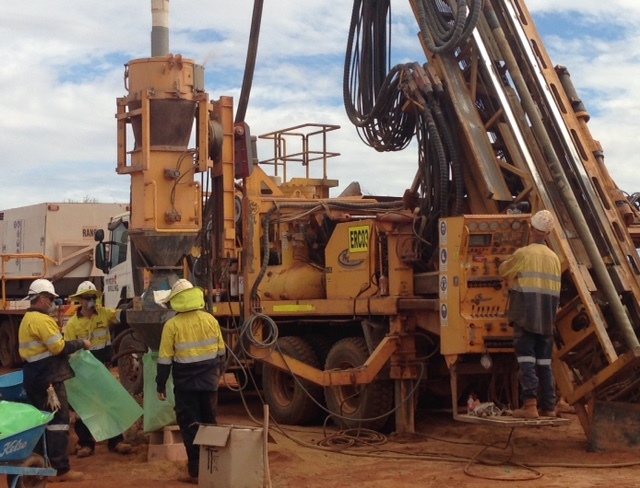 To date the focus of exploration has been on increasing the resource at Bibra, which has been successful in increasing the resource by 850,000 ounces. The main prospect outside the Bibra area is the Francopan prospect, this was the original discovery made by WMC in 2004. Francopan is located 5km to the south-east of Bibra and has similar geology, geometry, grade and size as Bibra. 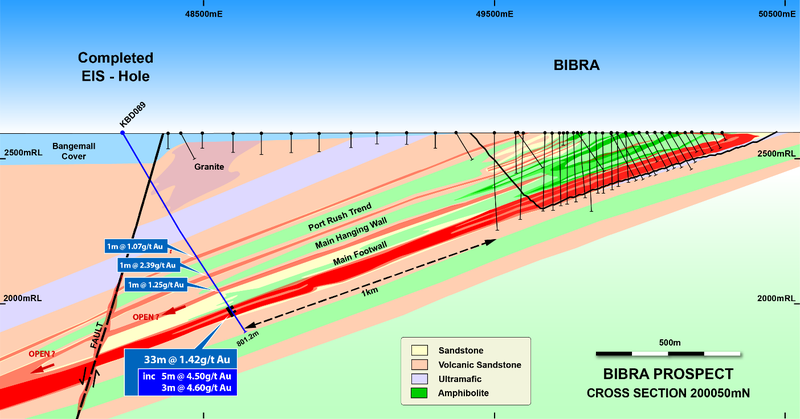 The detailed work completed at Bibra and Francopan has allowed the identification of key geological features responsible for the gold deposit formation. 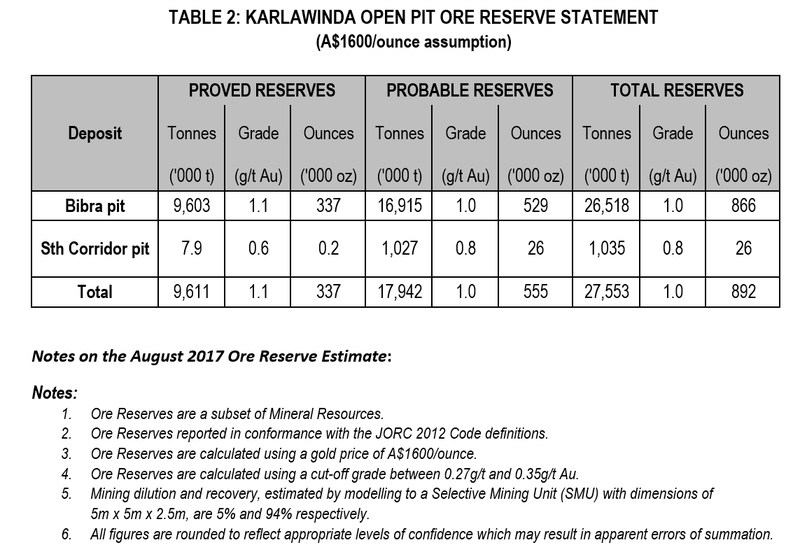 These key features are being applied through the Karlawinda project tenure to identify areas where new Bibra style gold prospects may occur. 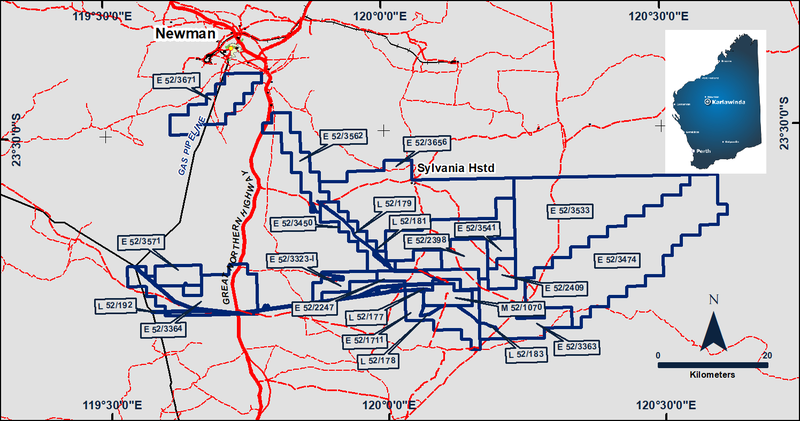 Exploration in the broader area remains at an early stage. Regional exploration outside the main prospect areas of Bibra and Francopan consists of mainly wide spaced aircore holes within 5km of Bibra. Outside this area exploration consists of wide spaced geochemical sampling and airborne geophysics. This is a 25% increase from the previously announced maiden Ore Reserve of 713,000oz (see ASX release 7 August 2018). Gold production is forecast to increase from 660koz over 6.5 years to 820koz over 8 years, which includes an increase of 16koz in the first two years of production. The Ore Reserve final pit design allows for a four-staged open pit (Feasibility Study design was three-stage) and a life-of- mine (LOM) stripping ratio of 4.8:1. Process plant design now incorporates a 4.8MW SAG mill and 4.8MW Ball mill (‘SAB’) from project commencement instead of the feasibility study which incorporated a 6.5MW SAG mill and the installation of a ball mill at the end of Year 2. The design of the previous comminution circuit allowed for treatment of a blend of laterite and oxide ores in Years 1 and 2 whereas the optimised circuit provides greater operational flexibility for the treatment of different ore types without the requirement to blend. The gold price assumption for Ore Reserves has increased from A$1500/oz to A$1600/oz. This increase is in line with peer companies and also reflects that spot gold prices have averaged in excess of A$1600/oz over the past 3 years. The cost of power has reduced by approximately 15% from the 2017 Ore Reserves as a result of further optimisation. The major change relates to the use of natural gas via a 56km pipeline connecting to the Goldfields Gas Pipeline rather than using trucked LNG. 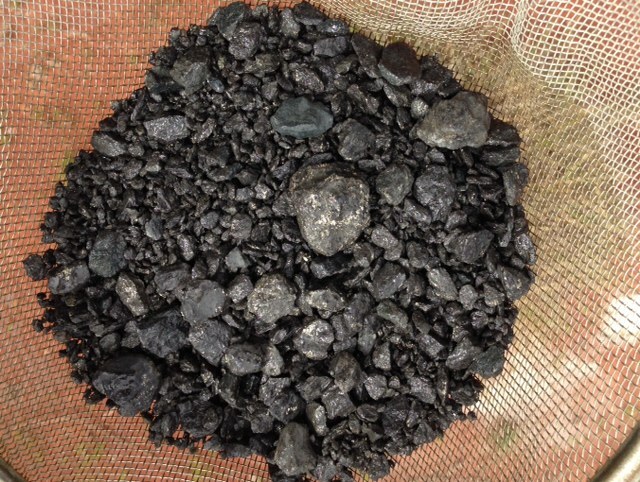 Ore processing costs have reduced from the 2017 Reserves and FS as a result of improved plant design and lower energy costs to $10.41 / t for laterite ore, $9.25/t for oxide, $10.84/t for Transition and $12.43/t for fresh ore.
Rock density has reduced slightly in the Oxide zone as a result of further testwork undertaken in 2018. The diesel fuel price assumption has increased by around 20% to A85c/litre (including rebate and excluding GST) from A70c/litre used in the feasibility study.